" There is always hope and rebirth... "
Age: 12-13 in S. Reborn at the end of S and in Stars ages rapidly from a baby, to a child of about 4 then finally returns to her previous age of 12-13. As a young girl kept isolated by her father because of her "condition," Hotaru has no friends. Her mother died when she was young. Her schoolmates fear and dislike her because she injured one of them while under the influence of Mistress 9. Constantly teased and ridiculed by her father's "assistant" Kaolinite, Hotaru leads a sad and lonely life. However Hotaru experienced the magic of true friendship when she meets her best friend, Chibiusa. They met one day after Hotaru caught Chibiusa's hat before it fell in the river. The two of them strike up an immediate friendship. We see that Hotaru has the power to heal injuries when she heals a scratch on Chibiusa's knee. It was in part Hotaru's friendship with Chibiusa that gave her the strength to defeat the evil Mistress 9. In the final battle against the Death Busters, Sailor Saturn jumped into a black vortex to destroy Pharoah 90. Super Sailor Moon followed her into the vortex even though Saturn ordered her not to, and used the power of her crystal to revert Hotaru into a baby, so that she would have a chance at a normal, happy life. She lived with her father for a while, but at the beginning of Stars baby Hotaru is collected by Setsuna to come live with her and the other outers, because her powers are needed in the fight against Nepherenia and Galaxia. During the first fight between the outers and Nepherenia's "mirror paredories," baby Hotaru is attacked by one. Before it can do any damage, the sign of Saturn glimmers on baby Hotaru's forehead and a light blasts from it, shattering the mirror paredory to pieces and giving the outers the power to transform into Super Sailors. After this battle, baby Hotaru is a baby no longer. She has aged to become a young girl of about 4.She has no memories of what happened in S, but has been having strange premonitions. She studies every day in her new home with the outers. She has a very advanced mind for a young girl of 4. Finally one night Sailor Saturn appears to little Hotaru in a vision, returning her memories to her and aging her back into the young girl she was in SMS. As Sailor Saturn she joins forces with the other Senshi to give Sailor Moon the power to transform into Eternal Sailor Moon. At the end of Stars she is seen happily hanging out with the other outers. Sailor Saturn is probably the most powerful senshi She has the power to destroy the world... but using that power will also destroy her. 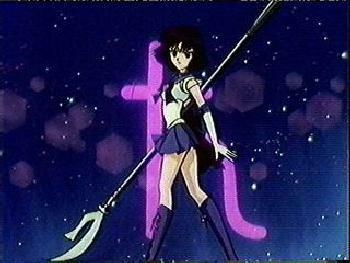 Sailor Saturn was possessed by the evil messiah, Mistress 9. She's physically weak, and often suffers from coughing fits and fainting spells. She has the power to heal as well as destroy. Her weapon is the Silence Glaive, a long polearm than can cut through anything. Hotaru was Dr. Tomoe's only child and was killed in a lab explosion. Her father was devastated. Suddenly the Daimon Master appeared. He offered to revive Hotaru in exchange for Dr.Tomoe's soul. He agreed and became evil. What Tomoe didn't know was that when he agreed, the entity of Mistress 9 went into her body. That's how Hotaru became possessed. Before Hotaru was reawakened as Sailor Saturn, she had the ability to paralyze enemies just by grabbing them. She used this power on a lot of enemies. Her castle is the Titan castle.